I make no apologies. When I watch and commentate on cricket, a glorious straight drive or a pull in front of square is a marvellous sight, as is the delicate touch from a late cut or the innovation of a "Dilscoop". Crowds around the world flock to watch Sachin Tendulkar, Kevin Pietersen and Chris Gayle, and quite rightly so. But... I like bowlers. Fast bowlers. Bowlers that make you sit upright and take notice of their power and pace, aggression and strength, and also (as bowlers tend to get a bad press in this respect) their intelligence in working out a batsman, or if all other tactics fail, "working over" one. Perhaps there is a touch of bias being a former bowler (or swinging dobber before you say it) myself, but when a quality quick gets the ball, the intensity of the game rises a notch or two. In my last piece from the Women's World Cup, I highlighted England's Katherine Brunt, who immediately took the competition by the scruff of the neck in the first match and stamped her authority on proceedings as if to say "there is a reason why I'm number one in the world." She's brilliant to watch, and like anyone who plays with a swagger, she backs it up with performances. India's Jhulan Goswami is another. Tall and lean, she is the Glenn McGrath of women's cricket, hitting awkward lengths and cutting the ball away. It's a shame that we haven't seen more of her after India's early exit from the tournament. Perhaps she didn't produce the goods after a strong showing against West Indies in the opening match, but I remember her causing plenty of problems for England in Taunton during their one-day international series last summer. It's unfortunate that at 29, age is against her, but there is no doubting her quality. Brunt and Goswami have been setting the standard for quite a while, but now a new breed has started to emerge - England's Anya Shrubsole, who is the tournament's joint leading wicket-taker, and two Australians in Ellyse Perry and Holly Ferling. Shrubsole, after missing the first match against Sri Lanka, took a while to find her rhythm in the second against India, but since then has blasted through every top order in the subsequent three games. First ball: Short of a length, forcing Cameron quickly into defence. Second ball: A full leg-cutter tempting the batter to drive, which she played and missed. Third ball: A hooping inswinger which knocked out middle stump. Fabulous, intelligent and highly skilled bowling. Perry and Ferling are almost clones of the Aussie great Cathryn Fitzpatrick who, handily, is head coach of the national side and is still the benchmark by which all female pace bowlers will be judged. Like Fitzpatrick, Perry and Ferling are tall and naturally athletic. Perry is a dual code international who has also represented Australia in football, with Ferling playing at a high level on the netball court. Both have strong, repeatable actions, so not a lot can go wrong. Perry is 22 and Ferling only 17. What exciting careers lay ahead for them and with Fizpatrick looking on, do not be surprised if either surpass her mark. 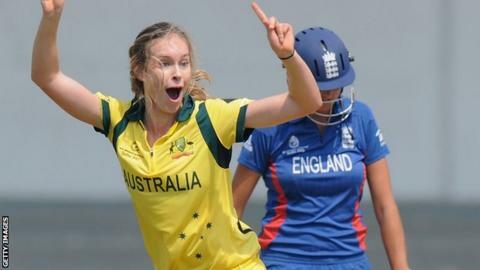 "It's something that brings people to the game, it creates excitement that the girls are not afraid to bowl the bouncers," Fitzpatrick tells BBC Sport. "I'm always going to be an advocate of the quick bowler, and I love watching cricket that generates oohs and aahs, which is happening now." So is Fitzpatrick hoping that players like Perry and Ferling act as role models for young girls who might want to become pace bowlers? "Absolutely, that's what we want," she affirmed. "Without a doubt when you are at a tournament like this, people are talking about the quicks. I hope young girls are talking about it, saying 'that's what I want to do'." And will her record of 180 ODI victims be broken? Fitzpatrick added: "I hope so, but it depends on them playing enough with the focus in women's cricket shifting to Twenty20. But I'd love to see Perry, Ferling or another quick break it." I've spotlighted five bowlers here, with others such as Marizanne Kapp from South Africa not far behind, but for the women's game to keep evolving and improving - and on the evidence of this World Cup, it will - there need to be more new-ball threats. With the ever increasing coverage of women's cricket, young girls now have players to look up to and emulate. Come 2017, it would be a real achievement to have a battery of elite pace bowlers represented in every side. I can't wait. Join Charles and the Test Match Special team for ball-by-ball commentary on England's third-place play-off game against New Zealand (on Friday) and the final - West Indies v Australia - on Sunday, on BBC Radio 5 live sports extra and via the BBC Sport website, where there will be live text commentary.